So let me ask you, what is your ultimate indulgence? I had a couple of close friends over on a Saturday night, and their only request is to have MEAT. haha. 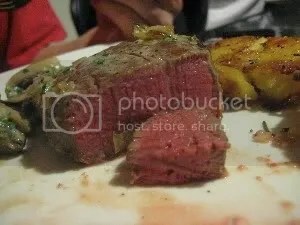 So, almost immediately, eye fillet popped into my tiny head. I have been dying to try this recipe of Gordan Ramsay’s and this would be the best opportunity to do so! 2. To prepare the topping, gently sauté the shallot and garlic in 1 tablespoon of olive oil for about 5 minutes until nicely softened. Add a further 2 tablespoons of olive oil and sauté the mushrooms over a high heat, stirring frequently, for about 7 minutes until browned and cooked. The mixture should be quite dry. If necessary, tip it into a sieve to drain off any remaining liquid. Remove the garlic clove and transfer the mushrooms to a bowl, allow to cool. 3. Whip the cream until softly stiff. 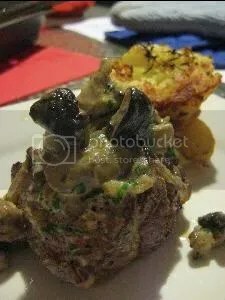 Fold in the mushrooms along with the egg yolk, herbs and a tablespoon of the grated Parmesan, then season with salt and pepper. Set aside. Season the steaks all over with salt and pepper. Heat a large non-stick frying pan until you can feel a strong heat rising. Cook the steaks for about 2-3 minutes, turning them to seal all over. Remove from the pan. 4. Put the steaks on a shallow baking tray. 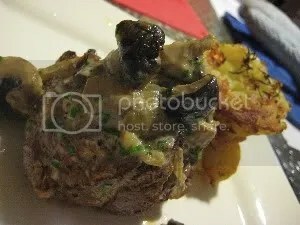 Pile the mushroom mixture on top of the steaks and dust with the remaining parmesan. Cook in the oven uncovered, for about 5-7 minutes until the topping is bubbling and golden. So, trust me. Try this recipe, I guarantee you will love it! (: Have it with mash or golden baked potatoes and ENJOY! so tell me dear readers, what is your ultimate indulgence?